Chanteur US né le 31 Décembre 1922 à Willcox (Arizona). Rex Allen s'était spécialisé dans la Country Music et a chanté pendant trois décennies. Il a enregistré pour Mercury, Decca, Wildcat, Hacienda, Vista et JMI Records et a aussi joué comme acteur dans plus de trente films pour Universal, Fox et Disney. Rex est décédé dans un accident de voiture le 17 Décembre 1999. Better-known as the Arizona Cowboy, Rex Allen was the last of Hollywood's singing cowboys. Between 1950 and 1954, Allen starred in 19 movies for Republic studios. The films launched a popular recording career for Allen, as he had several hit singles and albums in the early '50s, before the singing cowboys slowly disappeared from the charts. The son of a fiddle player, Rex Allen was given his first guitar when he was 11 years old; his father intended Rex to support him at dances. Shortly afterwards, Allen began singing. After he finished high school, he was hired as a performer by a Phoenix radio station, but he only stayed there for a brief time. Instead, Allen hit the rodeo circuit. His career as a rodeo rider was short-lived, as he suffered an injury from a bull. 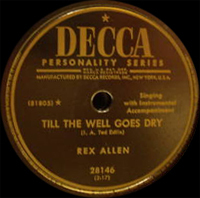 The injury led Allen back to singing, and he was hired by WTTM in Trenton, NJ, in 1943. After he left WTTM, Allen joined the Sleepy Hollow Ranch Gang in Pennsylvania. During the summer of 1946, Allen was spotted by Lulu Belle & Scotty; impressed, the duo recommended that he try out for the National Barn Dance and WLS in Chicago. Allen became a popular performer in the Windy City, which led him to become one of the first country & western artists signed by Mercury Records. 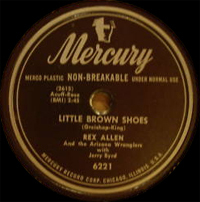 Mercury released several of Allen's singles before he had a hit with "Afraid" in 1949. That same year, Allen went to Hollywood. Bringing along a CBS network radio program, Allen approached Republic Pictures. 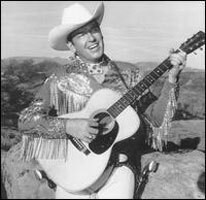 The studio signed the singer to a star in a film, The Arizona Cowboy, which was released in 1950. The movie was a success, beginning a string of 19 pictures that ran until February 1954. All of the movies were musical Westerns, starring Allen with a rotating cast of sidekicks. Frequently, he would star with Slim Pickens, but Buddy Ebsen and Fuzzy Knight also made their appearances in Allen's films. Allen's film successes led to a hit record in 1951, "Sparrow in the Tree Top." 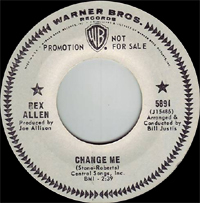 Released on Mercury Records, the single climbed into the country Top Ten and made it into the pop Top 30. 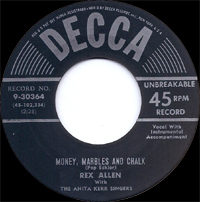 Soon after its release, Allen signed with Decca Records, which released his biggest hit, 1953's "Crying in the Chapel"; the song peaked in the Top Five and reached the Top Ten pop charts. In the latter half of the decade, he made a number of albums composed of Western songs. During this time, he acted in 39 episodes of the television program Frontier Doctor. 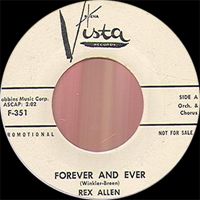 By the '60s, Rex Allen had re-signed with Mercury Records, which led to several minor hits and one major success — 1962's "Don't Go Near the Indians," which returned the singer to the country Top Ten and the pop Top 20. 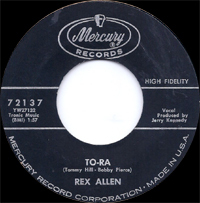 On his '60s stint at Mercury, Allen had two other significant hits — 1961's "Marines Let's Go" and "Tear After Tear" in 1964. In the late '60s, the singer went back to Decca Records, which resulted in one minor hit in 1968, "Tiny Bubbles." During this time and the early '70s, he recorded albums for Disneyland, Buena Vista, and JMI. However, he was more prominent in this era as a narrator for many Walt Disney films and television programs, as well as a voice in several Disney cartoons. In the '80s, Allen's oldest son, Rex Allen, Jr., became a star in his own right. A museum in his hometown, Willcox, AZ, was dedicated to Rex Allen, and the Governor of Arizona honored him. Allen occasionally appeared in Western film fare, where he remained as popular as ever. He died December 17, 1999, after his caretaker accidentally ran him over with a car; Allen was 78. 01/1951 SP MERCURY 5573-X45 (US) . The Roving Kind / John B. 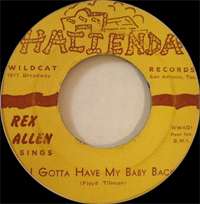 1961 EP HACIENDA 001 (US) I Gotta Have My Baby Back / Bell In The Steeple / ? / ?